Every programme I worked on developed me as a director, taught me new things and helped me hone my craft. No, do not worry, if you hire me to make videos for you, I’m not going to expect you to dress up in a brightly coloured suit and dance over a grassy field covered with flowers and bunny rabbits going “eh-oh”! 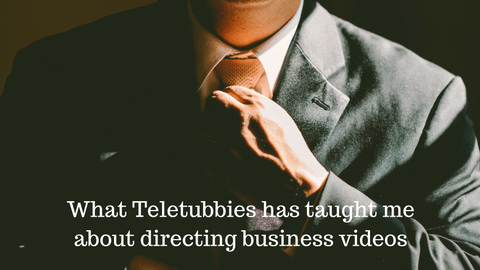 But it was what I learnt from Anne Wood, creator of Teletubbies, that I still use when I direct today. In early 2001, I was a location director on the show. I used to direct the little films that popped out the Teletubbies tummys, the ones featuring little children doing fun and interesting things. As a location director I had to come up with the ideas for the sequences, find the locations, cast the children, direct the sequences, record the voice over and supervise the edit. But before I could start I had to be fully briefed on the Ragdoll Productions way of directing. Ok, I don’t get to work with many child business owners, that said, I’m not going to try and direct you. Unless, that is, you have be trained as a presenter or performer. How many business owners are confident being in front of camera? Not many. Having a camera stuck in you face, a microphone dangled over your head and having “action” shouted at you can be most nerve wracking. Video production is unfamiliar and scary for many people, so my first job as a director is to make you feel safe, because when you feel safe you are more likely to come across naturally on camera. How do I do that? The truth is, I don’t really know, I just do… I guess I have a knack of making filming feel kind of everyday and nothing special. Having directed for nearly 30 years there’s very little that phases me, so when I arrive at a new location, I walk in with confidence, which helps put my contributor at ease. Ok, you’re not going to be getting the Scalextric or your My Little Ponies out during filming… Actually, if having a toy car race before a shoot, or platting a pony’s rainbow coloured hair makes you feel calm and helps you in front of camera then yes, have them in your office. For me playing means having fun in the shoot and getting you to do what you are most comfortable doing. So if you are confident delivering a 1-minute elevator pitch, I’ll making the filming feel like an elevator pitch. If you are comfortable answering client’s questions, I’ll pretend to be a client and ask you questions… I’ll just stand behind the camera so it captures the answers you are giving me. The idea is to make the process as fun and normal as possible. Filming the video needs to be the easiest and least intrusive part of the process. There is no point in having beautifully crafted shots if the person talking on camera is sweating profusely and stuttering their lines. Many production companies spend way too much time setting up the lights, creating the perfect framing, getting the location to look beautiful, but forget that all this preparation can add to the tension and affect the performance of the business owner. For me, all the technical stuff needs to be kept as simple as possible, or better still, handled well before the business owner appears. That way all the focus can be put on the performance. This is why I often film on my smartphone. If you know how, the quality can be as good as using bigger, more “professional” kit, but it doesn’t feel such a big thing. This helps make the whole filming process less threatening and much easier. Oh, and I don’t worry about scripts or autocue either, because unless you have been trained to deliver a script or use autoecue, you will not come across as naturally as you can. Great post. Brilliant insights into what goes on behind the scenes of your filming. It is the dread of going in front of a camera that sends me running for the hills. Your approach sounds very workable. Thanks for sharing. Thank you for you comment Debs. Do feel free to book a call with me and lets get you through that fear and started making awesome videos. Thanks for this insightful post, from an absolute newbie when it comes to creating videos. You made the behind the scenes workings less mysterious. Now, if I could get used to the idea of being in front of the camera..
Love the comparisons, and especially the importance of play in the process. Play is a greatly undervalued tool unless you’re in a creative field. I’ve been incorporating much more video in my blog recently and use my smartphone. The results have been quite surprising, if a little rough around the edges. Thanks Cathy. Do shout if you’d like any support with your video making. I’m currently working with another artist to assist her in creating “stories of the painting” that shows the whole process of her creating her artwork, with time lapse and insights.